Editor/Author Doenges, Marilynn E., Moorhouse, Mary Frances and Murr, Alice C.
This quick-reference tool has what you need to select the appropriate diagnosis to plan your patients care effectively. 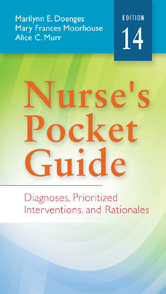 The 14th Edition features all the latest nursing diagnoses and updated interventions. A laminated "pocket minder" bookmark makes diagnosis even easier.